In 2014, one out of every four internet users in the United States wore a wearable device such as a smart watch or fitness monitor. As more people incorporate wearable devices into their daily lives, better techniques are needed to enable real, accurate health measurements. Currently, wearable devices can make simple measurements of various metrics such as heart rate, general activity level, and sleep cycles. Heart rate is usually measured from small changes in the intensity of the light reflected from light-emitting diodes, or LEDs, that are placed on the surface of the skin. In medical parlance, this technique is known as photoplethysmography. Activity level and sleep cycles, on the other hand, are usually measured from relatively large motions of the human body using small sensors called accelerometers. Recently, researchers have improved a technique called ballistocardiography, or BCG, that uses one or more mechanical sensors, such as an accelerometer worn on the body, to measure very small vibrations originating from the beating heart. Using this technique, changes in the heart’s time intervals and the volume of pumped blood, or cardiac output, have been measured. These are capabilities that other types of noninvasive wearable sensors currently cannot provide from a single point on the body, such as the wrist or chest wall. This method could become crucial for blood pressure measurement via pulse-transit time, a promising noninvasive, cuffless method that measures blood pressure using the time interval from when blood is ejected from the heart to when it arrives at the end of a main artery. 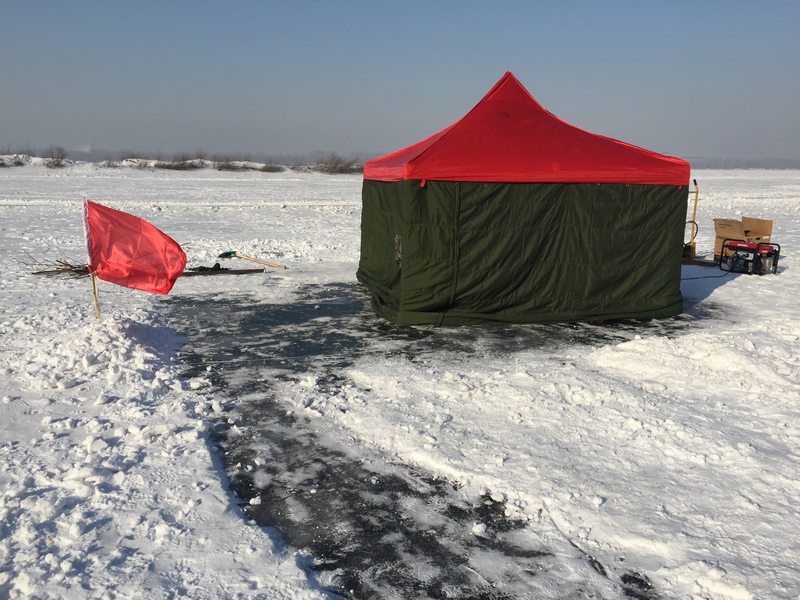 The goal of the preliminary study reported here was to demonstrate similar measurements recorded during immersion in an aquatic environment. Three volunteers wore a waterproof accelerometer on the chest while immersed in water up to the neck. An example of these vibrations recorded at rest appear in Figure 1. The subjects performed a physiologic exercise called a Valsalva maneuver to temporarily modulate the cardiovascular system. 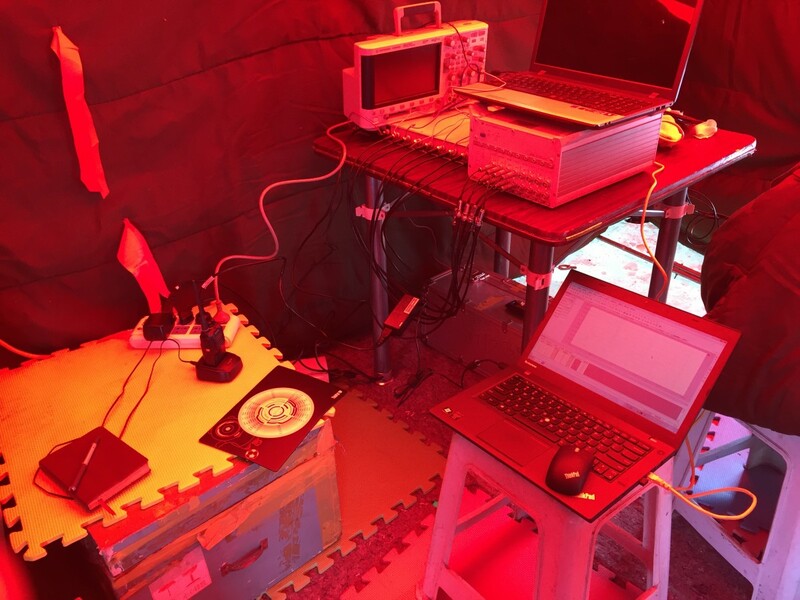 Two water temperatures and three body postures were tested as well to discover differences in the signal morphology that could arise under different conditions. Figure. 1. The underwater BCG recorded at rest. Measurements of the vibrations that occurred during single heart beats appear in Figure 2. 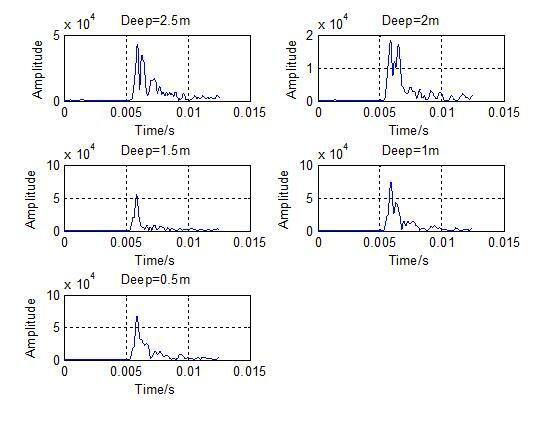 Investigation of the recorded signals shows that the amplitude of the signal increased during immersion compared to standing in air. In addition, the median frequency of the vibrations also decreased substantially. Figure. 2. 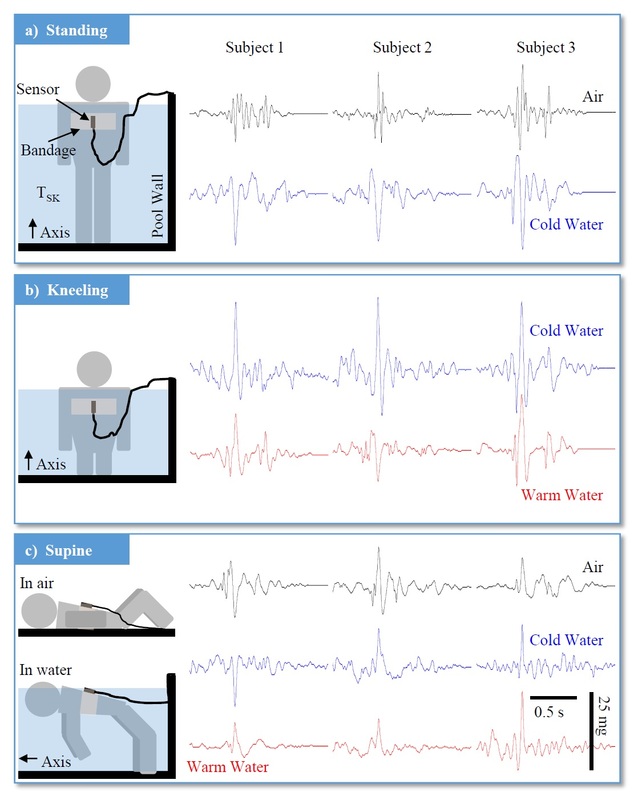 Single heart beats of the underwater BCG from three subjects in three different environments and body postures. One remaining question is, why did these changes occur? It is known that a significant volume of blood shifts toward the thorax, or chest, during immersion, leading to changes in the mechanical loading of the heart. It is possible that this phenomenon wholly or partially explains the changes in the vibrations observed during immersion. Finally, how can we make accurate physiologic measurements from the underwater wearable BCG? These are open questions, and further investigation is needed. Speech perception involves constant interplay between top-down and bottom-up processing. For example, to process phonemes (e.g. ‘b’ from ‘p’), the listener must accurately process the acoustical information in the speech signals (i.e. bottom-up strategy) and assign these sounds efficiently to a category (i.e. top-down strategy). Listeners’ performance in speech perception tasks is influenced by their experience in either processing strategy. Here, we use lexical tone processing as a window to examine how extensive experience in both strategies influence speech perception. Lexical tones are contrastive pitch contour patterns at the word level. That is, a small difference in the pitch contour can result in different word meaning. Native speakers of a tonal language thus have extensive experience in using the top-down strategy to assign highly variable pitch contours into lexical tone categories. 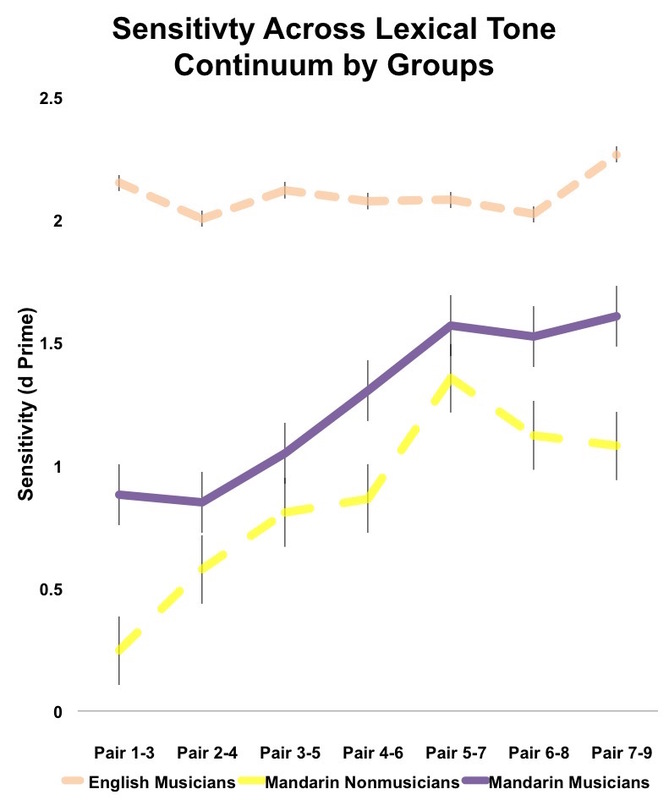 This top-down influence is reflected by the reduced sensitivity to acoustic differences within a phonemic category compared to across categories (Halle, Chang, & Best, 2004). On the other hand, individuals with extensive music training early in life exhibit enhanced sensitivities to pitch differences not only in music, but also in speech, reflecting stronger bottom-up influence. Such bottom-up influence is reflected by the enhanced sensitivity in detecting differences between lexical tones when the listeners are non-tonal language speakers (Wong, Skoe, Russo, Dees, & Kraus, 2007). How does extensive experience in both strategies influence lexical tone processing? To address this question, native Mandarin speakers with extensive music training (N=17) completed a music pitch discrimination task and a lexical tone discrimination task. We compared their performance with individuals with extensive experience in only one of the processing strategies (i.e. Mandarin nonmusicians (N=20) and English musicians (N=20), data from Zhao & Kuhl (2015)). (Fig. 2, yellow). 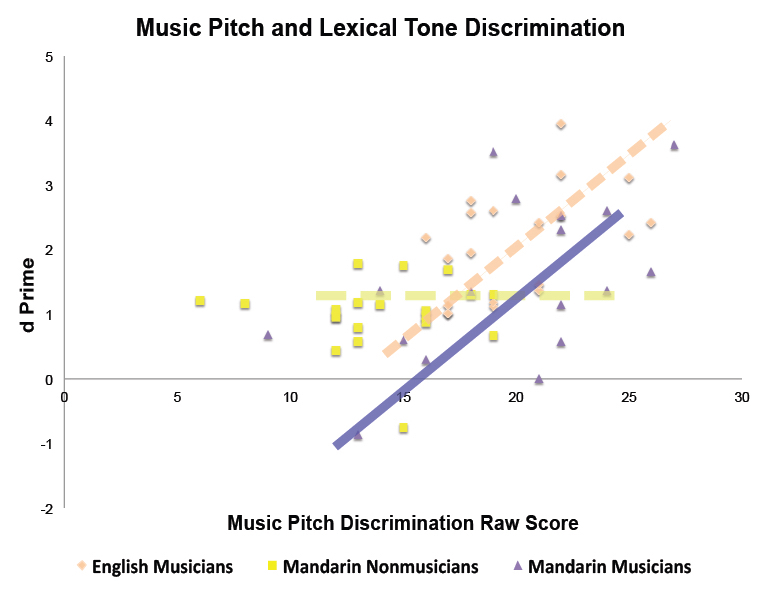 Specifically, for Mandarin nonmusicians, the music pitch discrimination scores do not correlate with the lexical tone discrimination scores, suggesting independent processes. When an object (sound source) produces sound, that sound can be used to locate the spatial position of the sound source. Since sound has no physical attributes related to space and the auditory receptors do not respond according to where the sound comes from, the brain makes computations based on the sound’s interaction with the listener’s head. These computations provide information about sound source location. For instance, sound from a source opposite the right ear will reach that ear slightly before reaching the left ear since the source is closer to the right ear. This slight difference in arrival time produces an interaural (between the ears) time difference (ITD), which is computed in neural circuits in the auditory brainstem as one cue used for sound source localization (i.e., small ITDs indicate that the sound source is near the front and large ITDs that the sound source is off to one side). We are investigating sound source localization when the listener and/or the source move. 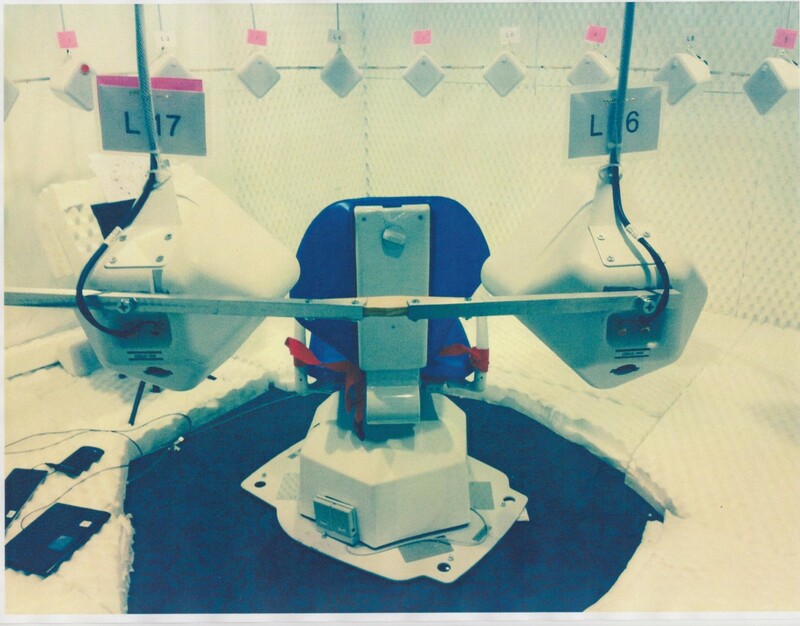 See Figure 1 for a picture of the laboratory that is an echo-reduced room with 36 loudspeakers on a 5-foot radius sphere and a computer-controlled chair for rotating listeners while they listen to sounds presented from the loudspeakers. Conditions when sounds and listeners move presents a challenge for the auditory system in processing auditory spatial cues for sound source localization. When either the listener or the source moves, the ITDs change. So when the listener moves the ITD changes, signaling that the source moved even if it didn’t. In order to prevent this type of confusion about the location of sound sources, the brain needs another piece of information. We have shown that in addition to computing auditory spatial cues like the ITD, the brain also needs information about the location of the listener. Without both types of information, our experiments indicate that major errors occur in locating sound sources. When vision is used to provide information about the location of the listener, accurate sound source localization occurs. Thus, sound source localization requires information about the auditory spatial cues such as the ITD, but also information provided by systems like vision indicating the listener’s spatial location. This has been an underappreciated aspect of sound source localization. Additional research will be needed to more fully understand how these two forms of essential information are combined and used to locate sound sources. Improving sound source localization accuracy when listeners and/or sources move has many practical applications ranging from aiding people with hearing impairment to improving robots’ abilities to use sound to locate objects (e.g., a person in a fire). [The research was supported by an Air Force Office of Scientific Research, AFOSR, grant]. Figure 1. The Spatial Hearing Laboratory at ASU with sound absorbing materials on all walls, ceiling, and floor; 36-loudspeakers on a 5-foot radius sphere, and a computer controlled rotating chair. The acoustic environment is essential to wildlife, providing vital information about prey and predators and the activities of other living creatures (biophonic information) (Wilson, 1984), about changing weather conditions and occasionally geophysical movement (geophonic), and about human activities (anthrophonic) (Krause 1987). Small sounds can be as critical as loud, depending on the species trying to listen. Some hear infrasonically (too low for humans, generally considered below 20 Hz), others ultrasonically (too high, above 20 kHz). Biophonic soundscapes frequently exhibit temporal and seasonal patterns, for example a dawn “chorus”, mating and nurturing calls, diurnal and crepuscular events. 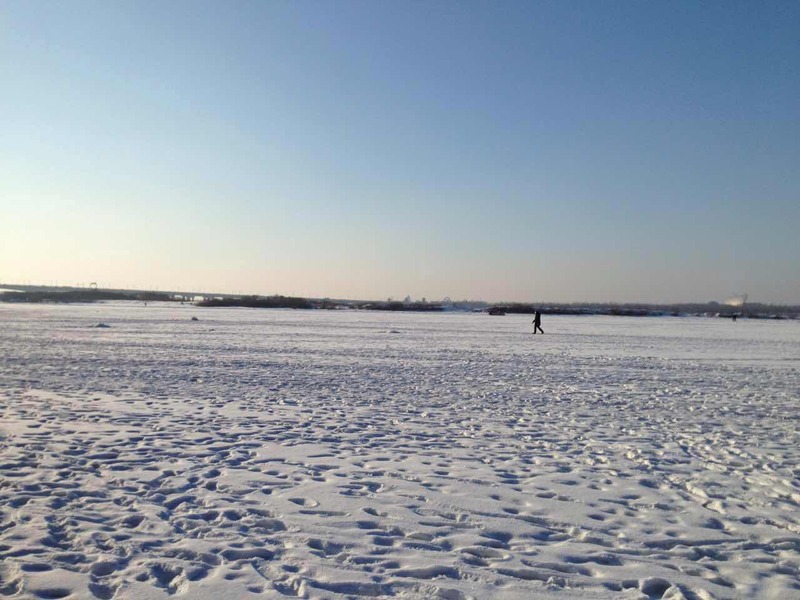 Some people are attracted to large parks due in part to their “peace and quiet” (McKenna 2013). But even in a desert, a snake may be heard to slither or wind may sigh between rocks. Does silence in fact exist? Finding truly quiet places, in nature or the built environment is increasingly difficult. Even in our anechoic chamber, which was purpose built to be extremely quiet, located in the heart of our now very crowded and busy urban campus, we became aware of infrasound that penetrated, possibly from nearby construction equipment or from heavy traffic that was not nearly as common when the chamber was first built more than 30 years ago. Is anywhere that contains life actually silent? As human populations increase, so do all forms of anthrophonic noise, often masking the sounds of nature. Does this noise cease at night, especially if well away from major cities and when humans are not close-by? 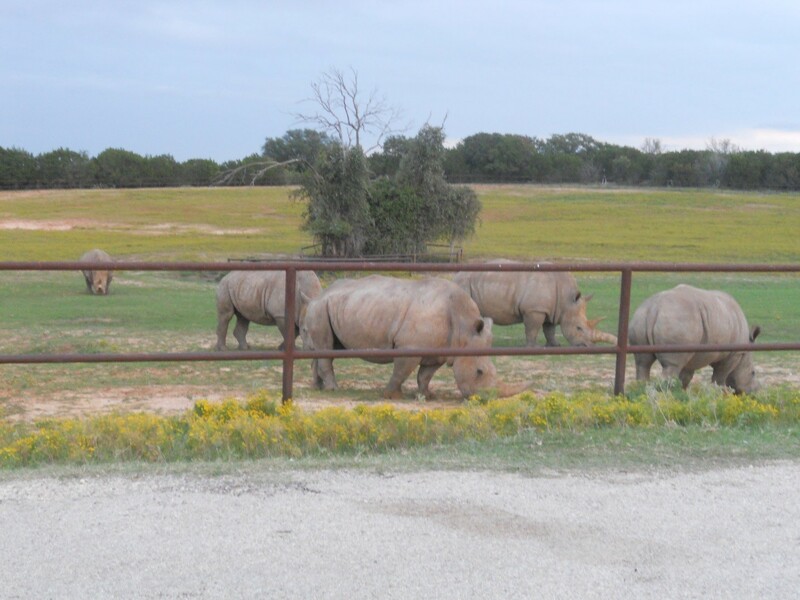 This study analyzed the soundscape continuously recorded beside the southern white rhinoceros (Ceratotherium simum simum) enclosure at Fossil Rim Wildlife Center, about 75 miles southwest of Dallas Texas for a week during Fall 2013, to determine the quietest period each night and the acoustic environment in which these periods tended to occur. Rhinos hear infrasound, so the soundscape was measured from 0.1 Hz to 22,050 kHz. Since frequencies below 9 Hz still need to be confirmed however, these lowest frequencies were removed from this portion of the study. Figure 3 illustrates the rhythm of a day at Fossil Rim as shown by the sound level of a fairly typical 24 hours starting from midnight, apart from the evening storm. As often occurred, the quietest period was between midnight and the dawn chorus. Figure 3: The sound pressure level throughout a relatively quiet day at the rhino enclosure. The loudest sounds were normally vehicles, machinery, equipment, aircraft, and crows. The 9pm weather front was a major contrast. While there were times during the day when birds and insects were their most active and anthrophonic noise was not heard above them, it was discovered that all quiet periods contained anthrophonic noise, even at night. There was generally a low frequency, low amplitude hum – at times just steady and machine-like and not yet identified – and depending on wind direction, often short hums from traffic on a state highway over a mile away. Quiet periods ranged from a few minutes to almost an hour, usually eventually broken by anthrophonic sounds such as vehicles on a nearby county road, high aircraft, or dogs barking on neighboring ranches. However there was also a strong and informative biophonic presence – from insects to nocturnal birds and wildlife such as coyotes, to sounds made by the rhinos themselves and by other species at Fossil Rim. Geophonic intrusions were generally wind, thunder or rain, possibly hail. The quietest quarter hour was about 4am on the Friday depicted in figure 3, but even then the absolute sound pressure level averaged 44.7 decibels, about the level of a quiet home or library. 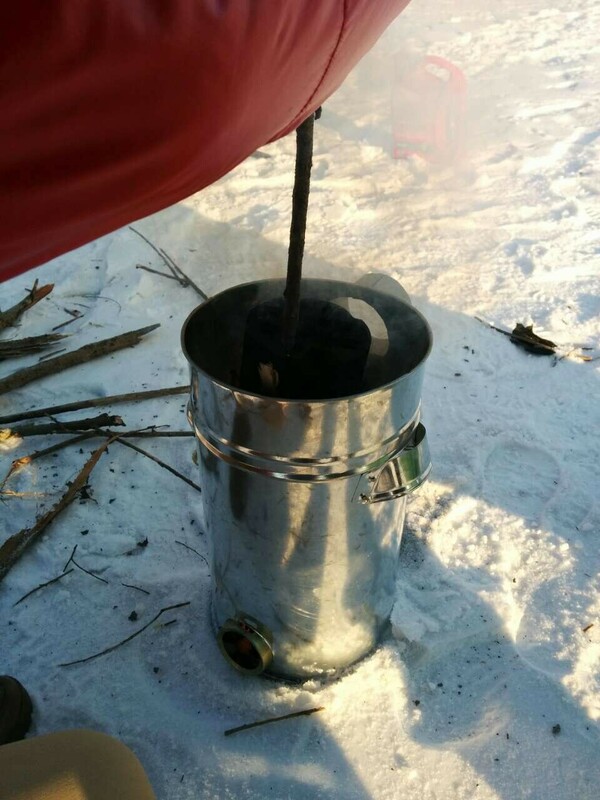 The wind was from the south southeast around 10 to 14 mph during this time. Audio clip 1 is the sound of this quiet period. Figure 4: The quietest quarter hour recorded at Fossil Rim appears between the vertical red selection lines, with an average absolute sound pressure level of 44.5 decibels. The fairly constant waveform shown in blue in the top graph and the low frequency noise at the bottom of the spectrogram seemed to comprise the machine-like hum, the distant traffic hum which varies over time, and insects. The blue flashes between 3 and 5 Hz were mainly bird calls. By contrast, the loudest of the “quietest nightly periods” was less than six minutes long, around 5am on Wednesday 23rd October, as shown between the vertical red lines in figure 5. Despite being the quietest period that night, it averaged a sound pressure level of 55.5 decibels, which is roughly the equivalent of a spoken conversation. Figure 5: The loudest “quietest period each night” reveals broadband machine noise (possibly road work equipment somewhere in the district?) which continued for some hours and appears as the blue flecks across all frequencies. The horizontal blue line at 16.5 kHz is characteristic of bats. All species identification is being left to biologists for confirmation. Audio clip 2 is this selection. Either side of the “quiet” minutes were short bursts of low frequency but intense truck and/or other machine noise indicated in red, some of which partially covered a clang when a rhino hit its fence with its horn, and distant barks, howls, moos and other vocalizations. The noise may have masked the extremely low frequency hums and insects that had been apparent on other nights or to have caused the insects to cease their activity. The strata below 2.5 kHz appear more ragged, indicating they are not being produced in such a uniform way as on quieter nights, and they are partially covered by the blue flecks of machine noise. However the strata at 5.5, 8.5, 11 and especially at 16.5 kHz that appeared on other nights are still evident. They appear to be birds, insects and bats. Audio clip 3 contains the sounds that broke this quiet period. At no point during the entire week was anything closely approaching “silence” apparent. Krause reports that healthy natural soundscapes comprise a myriad of biophony, and indeed the ecological health of a region can be measured by its diverse voices (Krause 1987). However if these voices are too frequently masked or deterred by anthrophonic noise, animals may be altered behaviorally and physiologically (Pater et al, 2009), as the World Health Organization reports to be the case with humans who are exposed to chronic noise (WHO 1999). Despite some level of anthrophonic noise at most times, Fossil Rim seems to provide a healthy acoustic baseline since so many endangered species proliferate there. Understanding soundscapes and later investigating any acoustic parameters that may correlate with animals’ behavior and/or physiological responses may lead us to think anew about the environments in which we hold animals captive in conservation, agricultural and even domestic environments, and about wildlife in parts of the world that are being increasingly encroached upon by man. Krause, B. 1987. The niche hypothesis. Whole Earth Review . Wild Sanctuary. ———. 1987. Bio-acoustics: Habitat ambience & ecological balance. Whole Earth Review. Wild Sanctuary. McKenna, Megan F., et al. “Patterns in bioacoustic activity observed in US National Parks.” The Journal of the Acoustical Society of America 134.5 (2013): 4175-4175. World Health Organization. “Guidelines for community noise”. WHO Expert Taskforce Meeting. London. 1999.